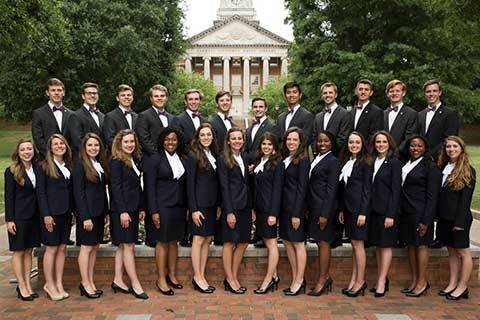 The Samford University Ambassadors strive to serve the university through leadership by building relationships. To represent Samford University and its students, faculty, staff and alumni. To assist Samford University administration and act as liaisons between Samford University and its many constituencies, including the Board of Trustees, the Board of Overseers, alumni, current and prospective donors, parents, faculty, staff, the community at-large and Samford University students. To serve as hosts at Samford University special events on and off campus. To serve the university community through leadership building internal and external relationships for its advancement. To positively and accurately communicate the Samford story with constituents. To assist the president of the University and the vice president for university advancement whenever a need arises. The male Samford Ambassadors are proudly wearing "The Beeson" Bowtie from Brier & Moss Clothiers. Brier and Moss, founded by two Samford alumni, named this signature tie after Samford's own Ralph Waldo Beeson. The Samford Ambassadors thank Brier & Moss for their partnership.